U.K. biodiesel producer Greenergy has just acquired Singapore-based used cooking oil exporter Rexon Energy. The acquisition comes less than two months after purchasing an idle biodiesel facility in Amsterdam from Oiltanking Amsterdam B.V.
Renewable jet fuel producer World Energy announced its participation in United Airlines’ biofuel flight from San Francisco International Airport to Zurich Airport Sept. 14. The United Boeing 787 will be powered by a 30 percent blend of biojet fuel. Germany's consumption of on-road diesel fuel and gasoline in the first half of 2018 was lower than in the same period in 2017, but the use of biodiesel and ethanol saw a significant rise. 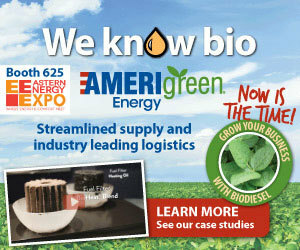 From January through June, biodiesel use was up 11 percent. The NBB celebrated 10 years in its current Jefferson City, Missouri, office Sept. 10 and commemorated a decade of growth and milestones with a formal ribbon-cutting ceremony at the site, which was previously vacant and remodeled 10 years ago. Iowa biodiesel producer Tom Brooks of Western Dubuque Biodiesel will serve a third term as chair of the Iowa Biodiesel Board. The directors elected officers during the IBB and Nat'l Biodiesel Board Regional Annual Meeting Sept. 12-13 in Des Moines.